Bryant Park shares a design team with our sister BID, the 34th Street Partnership. The same team that brought you petal inspired litter receptacles, and custom jewel box Holiday Shop kiosks has been hard at work on design improvements for the fare collection machines at NYC's new Select Bus Service stops. You can hear from the designers on how the new graphics make the machines easier to use, and see more pictures after the jump. 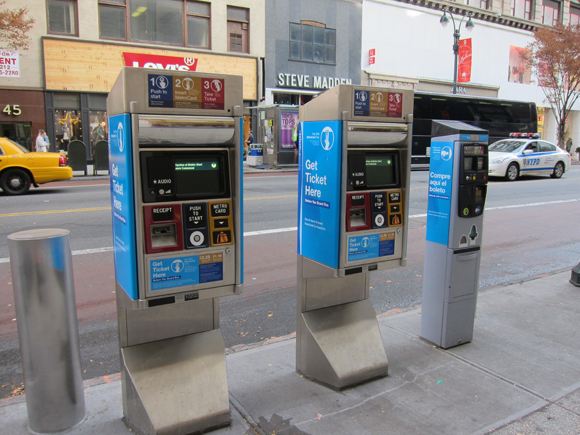 The new Select Bus Service (SBS) on 34th Street, launched over the weekend by NYC Department of Transportation and MTA New York City Transit, requires pre-boarding fare collection at sidewalk vending machines. Naturally, this will cause some confusion for riders. 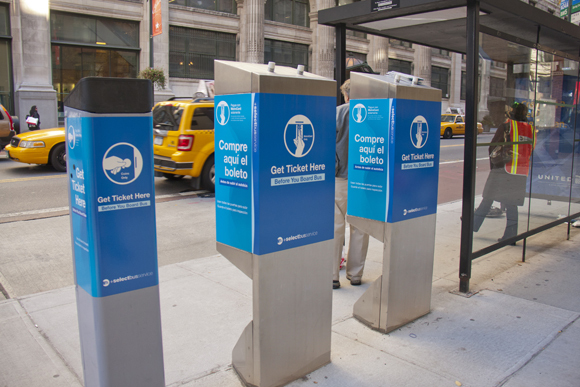 To take some of the anxiety out of the process, the 34th Street Partnership’s Design Department worked with DOT and MTA to create graphics that make the vending machines easily identifiable to potential users, simple to understand, and user-friendly. Besides relying on their own expertise, the team went out into the field to solicit ideas from commuters on existing SBS lines. “We rode the system on Second Avenue, spoke to users, and came up with several low-cost design improvements that will make the system work more intuitively,” says 34SP Industrial Designer Julie Ember. For just one example, they found that users were confused by the word ‘Receipt’ on the user interface and replaced it with the word ‘Ticket’, which is much more accurate. The new iconography is clear; all text uses mixed-case lettering and a friendly font and is conveyed in simple language. “The system of icons we created replaced a lot of the text on the existing signs” said Graphic Designer Jamie Song, ”The icons get the message across quickly no matter what language the user speaks”. The new graphics also feature directions for each step of the purchasing process that are color-coded with the corresponding area of action; and the overall design coordinates well with the other elements of the system. 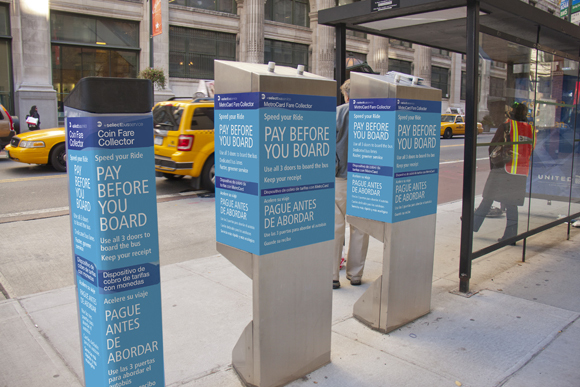 All messages are visible in English and Spanish, and the design takes into account the visually impaired and other users with special needs. Best of all, the new design can be applied to existing machines easily and at the same cost as the previous design. “It was a great collaboration between the three entities that will make the city a little better for everyone” said Ciocchini. The 34SP wishes DOT and MTA well in this new service, and is pleased to be able to help in this way.